Between Us Only! : Short Takes – Two! Title: Between Us Only! : Short Takes – Two! Back again for the next installment in his critically-acclaimed series, Majid Al Suleimany offers a new collection of articles that deal with the delicate matters that many are scared to touch. Back again for the next installment in his critically acclaimed series, Majid Al Suleimany offers a new collection of articles that deal with the delicate matters that many are scared to touch. Adapted from his successful newspaper column in The Oman Daily Observer, the enlightening and educational articles of Between Us Only! : Short Takes – Two! cover everything from human suffering and social trends to divorce and prejudice. Touching on some of the social evils prevalent in today’s society, this fantastic collection uses a mixture of witty observations and heavy blows to get its point across. A labor of love filled with keen observations on twenty-first-century society, this insightful book carries priceless warnings, resentments, fears, and advice for readers everywhere. The varied and honest new collection of articles cover a multitude of topics, from lighthearted and entertaining stories to serious topics based off of universal societal issues. Full of interesting and educational articles and stories, this wonderful book is a captivating experience, especially for readers familiar with Arab customs, traditions, heritages, and legacies. Developed from weekly columns Al Suleimany writes, Between Us Only! follows up on the success of the previous books in the series and furthers the idea of private talks between friends on matters that many are too scared to touch. Often times delving into topics that aren’t always sweet, this enlightening book uses a clear and elegant prose to explore social evils in society as well as their lighthearted counterparts. A fantastic read for everyone from CEOs to students, Between Us Only! offers insightful and illuminating articles based off of a variety of topics that even apply to children, teenagers, and grandparents. Filled with varied topics that will entertain and inform readers of all backgrounds and walks of life, this eclectic collection will engross as it inspires and provides a wide range of knowledge on a multitude of important topics. Developed from weekly columns Al Suleimany writes, Between Us Only! follows up on the success of the previous books in the series and furthers the idea of private talks between friends on matters that many are too scared to touch. Often times delving into topics that aren’t always sweet, this enlightening book uses a clear and elegant prose to explore social evils in society as well as their lighthearted counterparts. Covering a variety of priceless topics, this wonderful collection of articles gives readers everywhere a glimpse into the issues that are prevalent in today’s society. Majid Al Suleimany has over twenty-five years of experience as a human resources specialist and over ten years of experience as a management and human resources consultant, expert, and advisor. For the past eight years, he has written weekly columns in The Oman Daily Observer, an English daily, which has led to three published books based off of his columns. He has recently expanded to a new column, At the Workplace. Al Suleimany has also published two other books on Arab management – www.myown-ebooks.com . Back again for the next installment in his critically acclaimed series, Majid Al Suleimany offers a new collection of articles that deal with the delicate matters that many are scared to touch. Adapted from his successful newspaper column in The Oman Daily Observer, these enlightening and educational articles cover everything from human suffering and social trends to divorce and prejudice. Touching on some of the social evils prevalent in today’s society, this fantastic collection uses a mixture of witty observations and heavy blows to get its point across. A labor of love filled with keen observations on twenty-first-century society, this insightful book carries priceless warnings, resentments, fears, and advice for readers everywhere. Al Suleimany has over twenty-five years of experience as a human resources specialist and over ten years of experience as a management and human resources consultant, expert, and advisor. For the past eight years, he has written weekly columns in The Oman Daily Observer, an English daily, which has led to three published books based off of his columns. He has recently expanded to a new column entitled, At the Workplace. Al Suleimany has also published two other books on Arab management. He began writing at age fourteen and has since developed a new approach that he feels is “direct from the heart.” Al Suleimany holds a master’s in international management. For more information on him, please visit www.myown-ebooks.com and www.majidbooks.com. Majid Al Suleimany has over twenty-five years of experience as a human resources specialist and over ten years of experience as a management and human resources consultant, expert, and advisor. For the past eight years, he has written weekly columns in The Oman Daily Observer, an English daily, which has led to three published books based off of his columns. He has recently expanded to a new column entitled, At the Workplace. Al Suleimany has also published two other books on Arab management. He began writing at age fourteen and has since developed a new approach that he feels is “direct from the heart.” Al Suleimany holds a master’s in international management. He is married and has three daughters and a son. For more information on him, please visit www.myown-ebooks.com and www.majidbooks.com. I have over twenty-five years of experience as a human resources specialist and over ten years of experience as a management and human resources consultant, expert, and advisor. For the past eight years, I have written weekly columns in The Oman Daily Observer, an English daily, which has led to three published books based off of my columns. I have recently expanded to a new column entitled, At the Workplace. I have also published two other books on Arab management. I began writing at age fourteen and have since developed a new approach that I feel is “direct from the heart.” I hold a master’s in international management. I am married and have three daughters and a son. 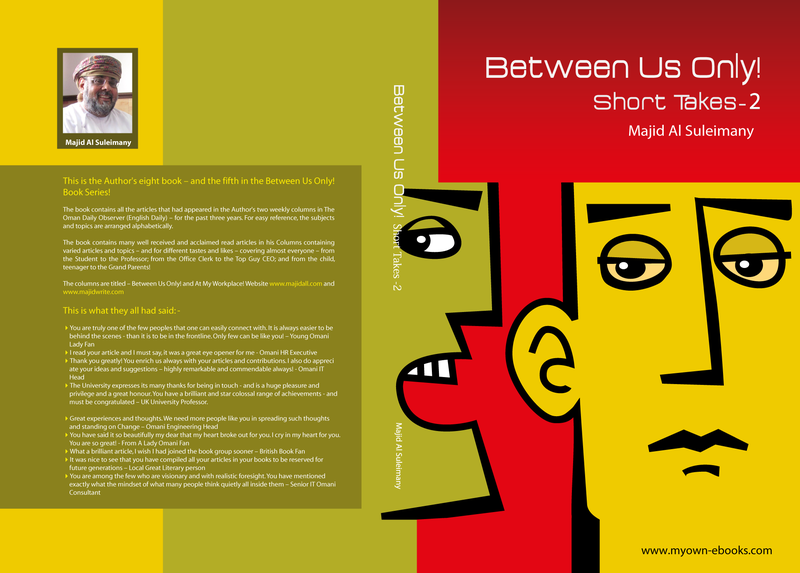 For more information, please visit www.myown-ebooks.com and www.majidbooks.com. I am a weekly columnist with The Oman Daily Observer and with a master’s in international management. His Majesty Meets Citizens in Bahla.